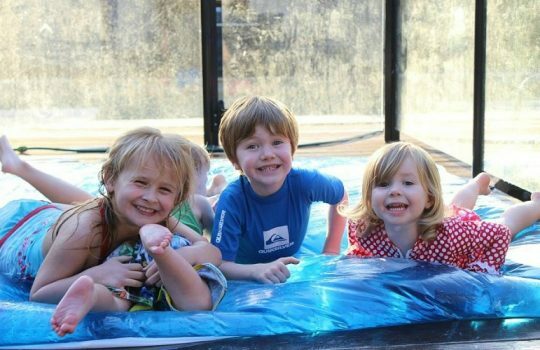 As you know, here at Paging Fun Mums, we are all about having fun with our families. 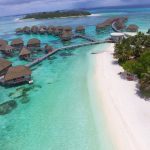 The school holidays are the best time to spend quality time with our kids and enjoy their special company without the routine of school lunches and after school activities. 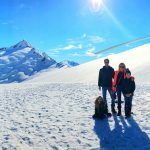 Steggles has sponsored this post because they’re all about families sharing quality time around the dinner table, at home and outside. They would like families to share their quality time images to help inspire others with family friendly activities and ideas, so we’re asking YOU, our fellow Fun Mums to help. 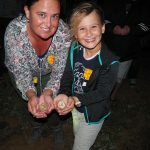 Simply publish an image of your family sharing quality time together via Instagram or Twitter using these Hashtags #Stegglerfor #qualitytime to go in the draw to WIN 10 Hoyts Movie Tickets! That’s right, there are TEN winners each receiving TEN movie tickets! Make sure to search the hashtags to see what others are sharing too! Winners will be selected by the Steggles team at the end of summer school holidays. 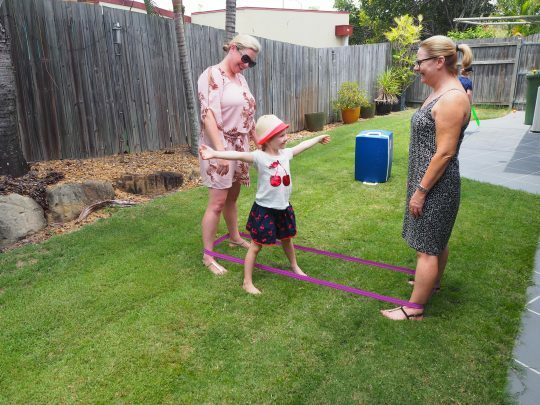 Here are some simple & inexpensive ways to have fun (and share quality family time) with your kids in the backyard theses holidays. 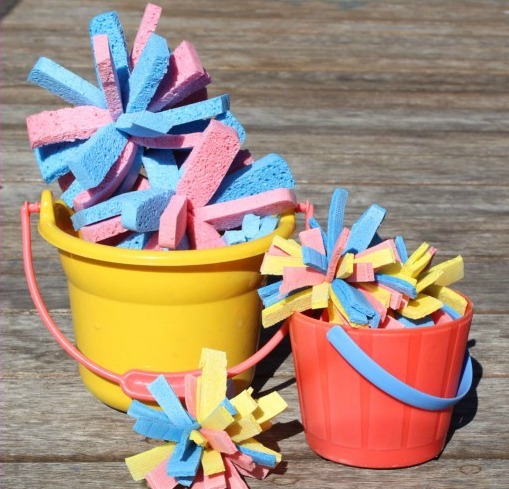 You don’t need a pool and buckets of money, just some simple props and a zest for fun! We all remember how fun this was as a kid…and trust me, this hasn’t changed! 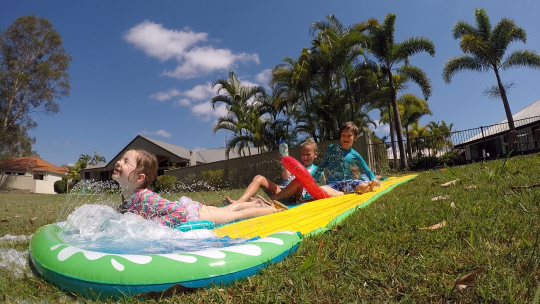 We recently got out the Slip n Slide and had an absolute ball in the backyard – parents and all, the giggles could be heard up the street..and that was just the parents! 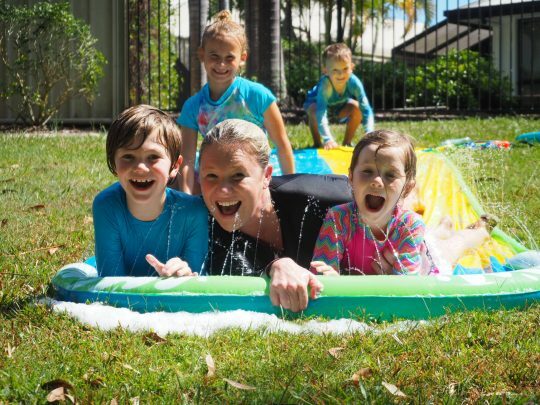 The kids love to watch their parents being silly and the Slip n Slide is just the way to do that! 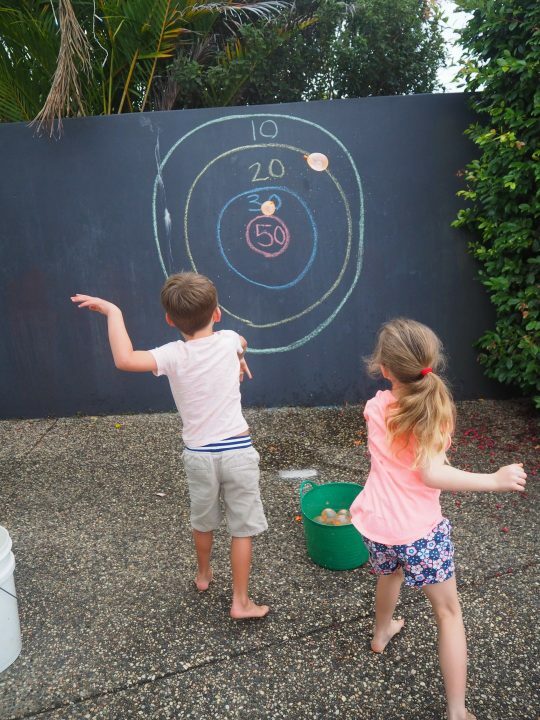 All you need is a wall, some chalk and a few water balloons and you are well on your way to an afternoon of competitive fun! See how many points each player can earn by hitting the bullseye with the water balloons. These are so simple to make and are so much fun! 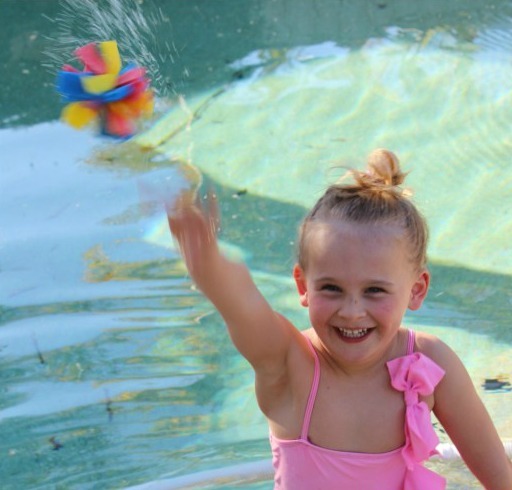 Head here for the easy instructions and begin your backyard splat ball fight today. You can even dip these in paint and throw them at a canvas to make your own family summer canvas art! 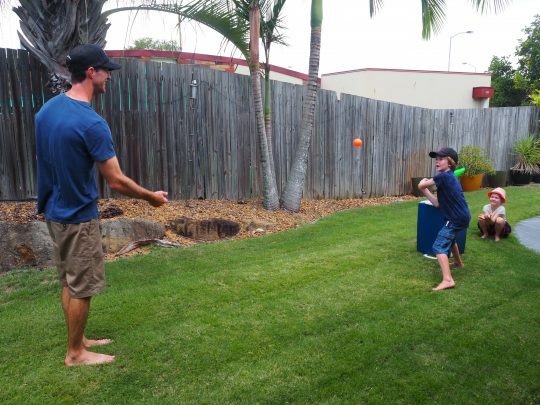 You can buy a cricket set from your local $2 store and have a ‘ball’ in your backyard. You can use the old Esky as some stumps too if you like – that’s what we do! Who doesn’t love a water balloon battle! 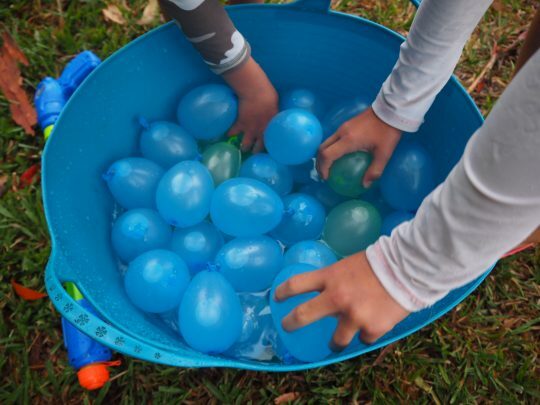 Fill a giant bucket full of water balloons and let the good times roll. I never know who has more fun with this…the parents or the kids! Did you know you can make this at home with some plastic and a hair straightener? It’s so simple and the kids love it! 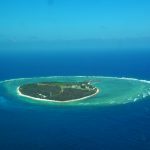 Head here to learn how. This is a great sensory play idea for kids that can double as a cool outdoor lounge. Why not set up an outdoor movie night and enjoy the night stars whilst enjoying each other’s company. We’ve also created a Glowing Water Blob and a Water Blob Twister game with this technique too! We all remember playing this game as kids…well it’s back! It’s simple, inexpensive and always fun! I remember the old ‘England, Ireland, Scotland, Wales’ song, but there are plenty of others (on Google) if you don’t remember them all. This game is fun for the Grandparents to get involved in too. 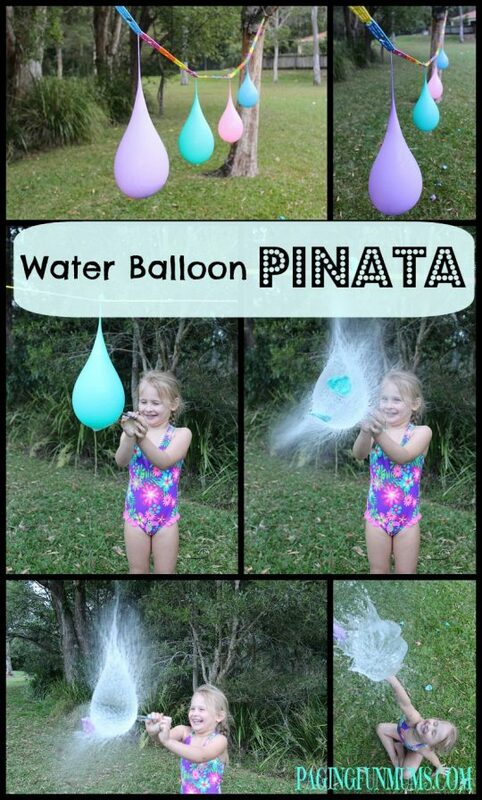 We made this Water Balloon Piñata and the kids LOVED it! Once again, this is so simple and easy to set up. 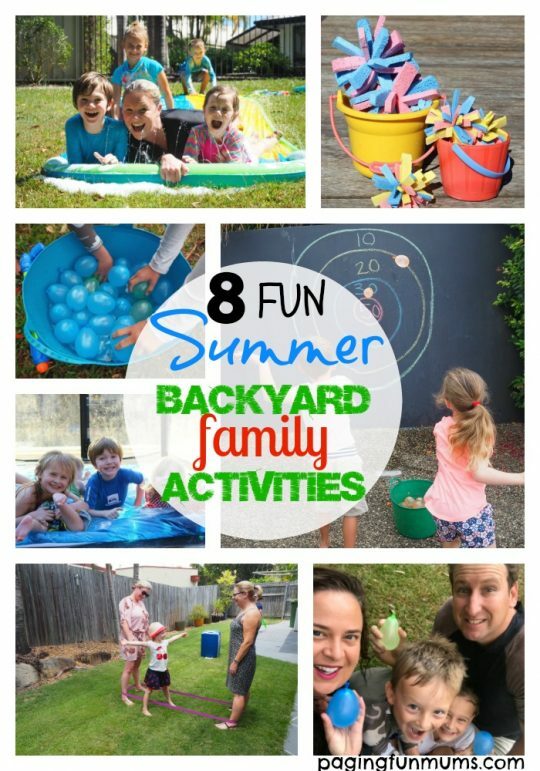 Click here to learn how and enjoy some quality time having fun with your family this summer. 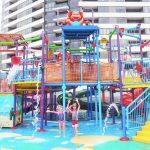 Check out our cute video of our kids enjoying some summer fun these holidays. After an action packed summer day, we like to sit down to a hearty and delicious summery meal. 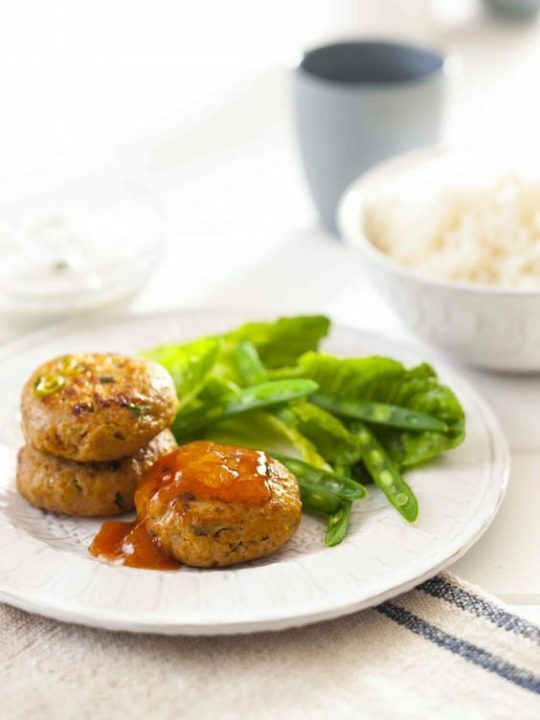 Steggles have these amazing ‘Sundried Tomato & Thyme Chicken Rissoles‘ which only require FOUR ingredients! 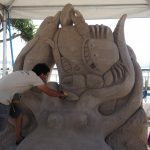 The kids can even make them. Getting in the kitchen with the kids is another fun activity for the whole family. In a bowl mix together the chicken mince, breadcrumbs, tomatoes and thyme leaves. Divide mixture into 12 equal portions. Shape each portion into small rissoles. Refrigerate for 15 minutes. Cook rissoles in batches in a lightly greased frying pan over medium heat. Cook for about 8 minutes turning during cooking until golden and cooked through. Serve these with salad and rice and you have yourself a winning summer meal that your kids will devour! 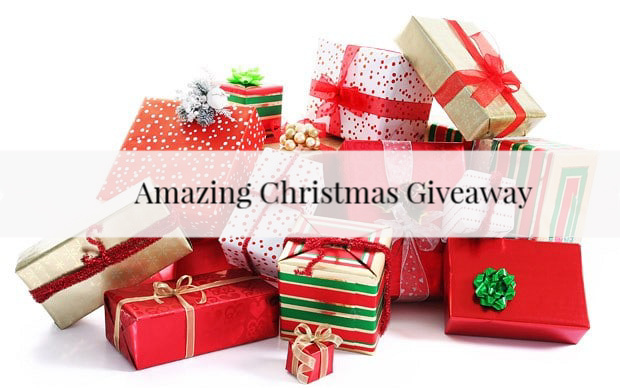 Steggles are running a competition to celebrate Quality Time over the school holiday period. There are TEN lots of TEN Hoyts Movie Tickets up for grabs! To enter, simply share your own family quality fun times by uploading a photo to Instagram or Twitter using the hashtags #stegglerfor #qualitytime. It’s so easy! We also couldn’t help but share this heart warming video from Steggles, it makes us want to share a huge family meal! « New Moana glasses in-store at Specsavers!